Sea Gastronomy is a thoroughly impressive work that shows a deep awareness of the importance of sustainable fishing. 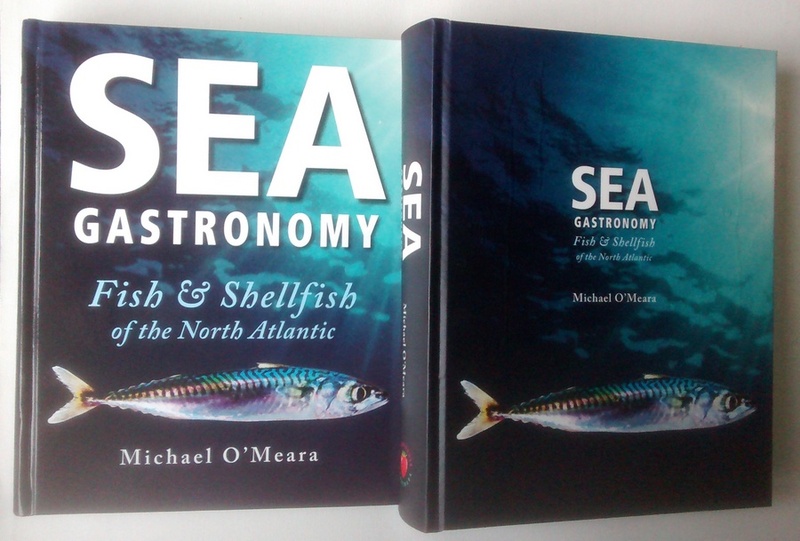 Its encyclopaedic quality is strengthened by consultation with marine biologists and other experts, and Michael’s skills in the restaurant are complemented by his talents as a photographer: most of the book’s 380 colour photos are his own, taken as opportunity arose offshore and in the kitchen over several years. Ireland is a small island and its people are enthusiastic cooks and diners, but we’re often strangely cautious about seafood, shying away from unfamiliar names and over-relying on frozen supermarket fare. Sea Gastronomy tackles this deficit head-on by including guides to buying, storing, and preparing all sorts of fish and seafood, along with insider tips to engage beginners and professionals alike. I love cooking but I’m just a dabbler, and I learned a lot from the book – and not just about food but about areas like taxonomy and marine ecology. I may be biased because I copy-edited it, but I’m in good company in considering Sea Gastronomy something special. Sunday Times restaurant critic Ernie Whalley, who wrote the book’s foreword, calls it ‘a masterpiece’ and ‘a work of considerable scholarship’. McKenna’s Guides says it is ‘a landmark in Irish food publishing’ that ‘performs the vital task of demystifying the very thing that should be the backbone of our national cuisine’. Georgina Campbell’s glowing review describes Sea Gastronomy as a ‘stunning and very timely book’ whose ‘deep respect for marine resources . . . will make it an invaluable resource for schools and colleges as well as home cooks’. She says it is ‘a game changer in the way we understand, value and cook with the treasures of the ocean’. covers purchasing, storing, preparation and cooking of 120 species of fish and shellfish with an authority and lucidity that demands it instantly become the standard seafood textbook for any culinary education institute in the land. The accompanying original recipes for each species are thoughtful and inventive yet never lose sight of the pure simplicity that is the essence of any successful fish dish. 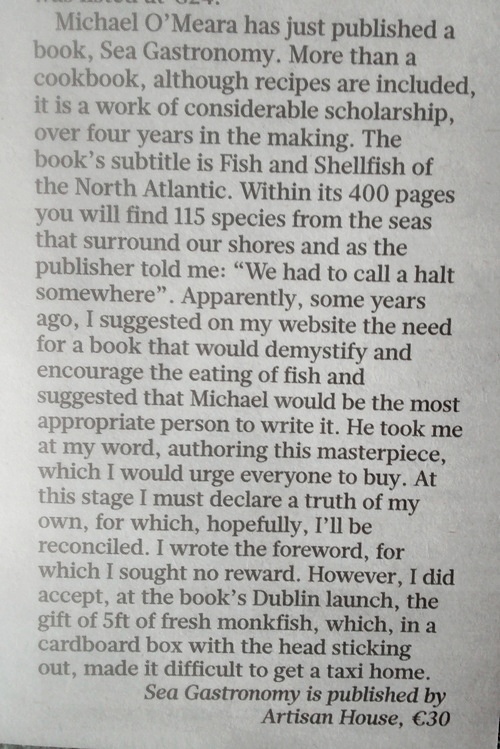 All in all, a towering achievement and if an Irish cook was compelled to choose a single seafood cookbook, any mulling over the choice has now been rendered utterly redundant. While the focus of Sea Gastronomy is Ireland, I’m sure it will appeal to cooking enthusiasts elsewhere too. It would make a beautiful gift for Christmas, or indeed a treat for oneself at any time of year. At €30 it is a steal, and there’s a limited edition for €100 (on the right in the photo above) with an original photographic print by Michael O’Meara. 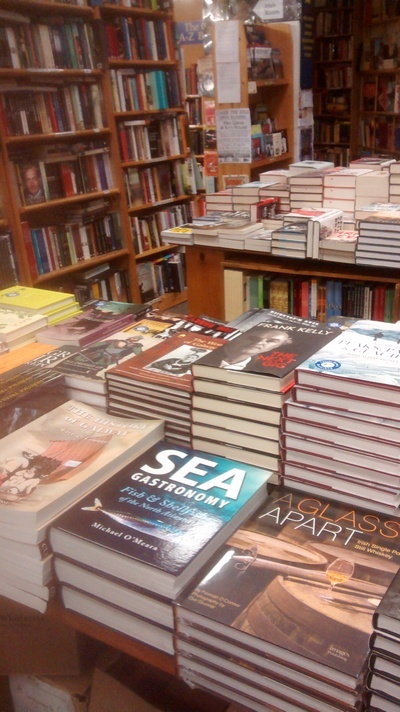 Sea Gastronomy has been named Cookbook of the Year in the annual awards by John and Sally McKennas’ Guides. Marie Claire Digby in the Irish Times selects Sea Gastronomy in her 10 best cookbooks of the year, and says it’s ‘probably the only book you’ll ever need on fish cookery’. The prestigious Gourmand Awards have shortlisted Sea Gastronomy for both its Cookbook of the Year award (the only book in Ireland the UK to attain this) and its Fish and Seafood Books award. It won! The 21st Gourmand World Cookbook Awards have named Sea Gastronomy the best seafood cookbook in the world 2016. 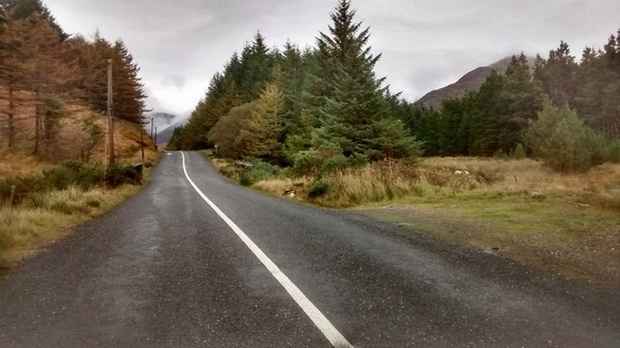 This entry was posted on Monday, December 7th, 2015 at 1:25 pm and is filed under books, editing, food, Ireland, personal, photography. You can follow any responses to this entry through the RSS 2.0 feed. You can leave a response, or trackback from your own site. Thanks for this brief insight into Ireland and your editing, Stan. I rarely cook and stopped buying Christmas presents many years ago; however, if I should ever need to purchase a gift for a cook, I’ll certainly consider this text. Thanks, Vinetta. As a cookbook (with frills) it’s definitely aimed at people who cook, but perhaps as you say it may appeal one day you’re buying a gift for someone who does.